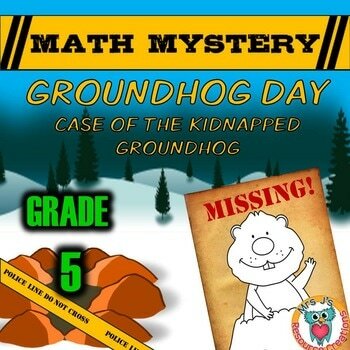 GRADE 5 Math Mysteries - Learning Made Fun! 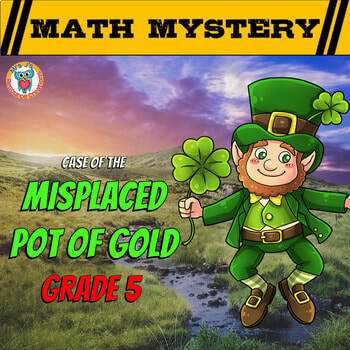 This end of year math mystery activity is a great puzzle for reviewing a variety of math skills at the end of the year. 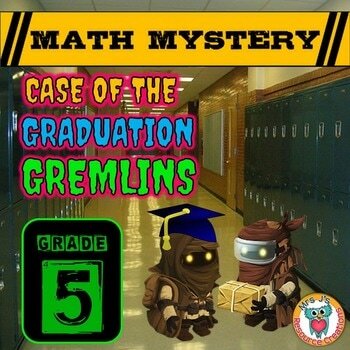 Students must use their math skills to eliminate places to find where the Gremlins are hiding with all of the graduation items! A Valentine villain is on the loose, known as the Heartbreak Hitman, shooting people all over town with a magic arrow that makes hearts turn dark. This is causing friendships to fall apart and couples to break up when they really didn’t want to; now so many people are sitting alone on this day feeling depressed and broken hearted. 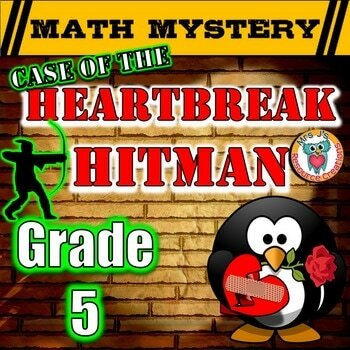 A great math detective is needed to help solve this case! 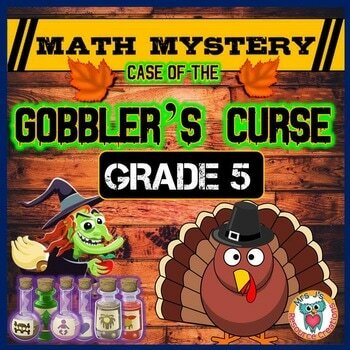 Thanksgiving Math "Case of the Gobbler's Curse" is a fun way to engage your students. 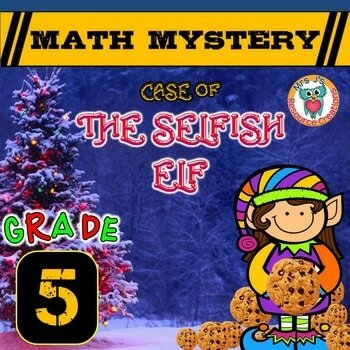 In this math detective story people have all started to lose the power of speech and cannot stop making "gobble, gobble" noises! Students must solve the worksheets to get clues as to which potion will return the power of speech in Mathhattan. Instructions and answer keys are all provided. 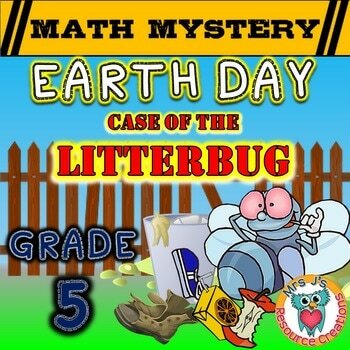 So make your day a little easier and try one of our math mysteries, your students will love them! 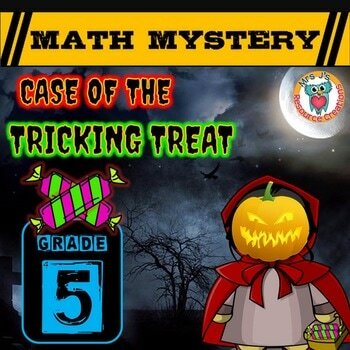 Students use their math skills to eliminate suspects so they can find out who has been giving out the tricking treat to children this Halloween! 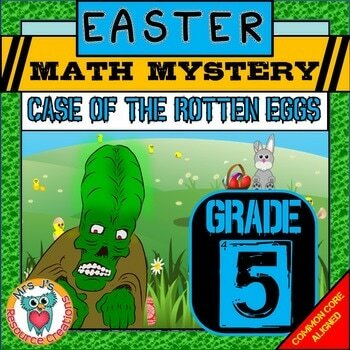 Students use their math skills to discover where the terrible Slimewort is hiding and put a stop to him making all of the Easter eggs rotten! A terrifying army of snowmen are marching towards our city by the hundreds and could be at your doorstep before dawn if they are not stopped! The people of Mathhattan are hoping that a brilliant math detective will be assisting Larry the Wizard and the police to find the Ice Queen. 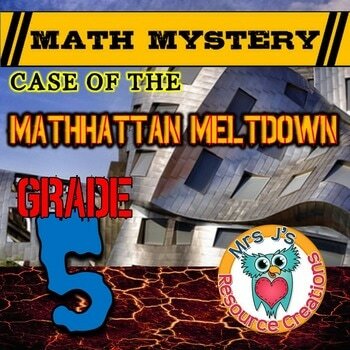 In this Summer Math Mystery Activity – Case of The Mathhattan Meltdown (GRADE 5) – students will find themselves trapped by the Scorcher who has been melting the city of Mathhattan this summer. 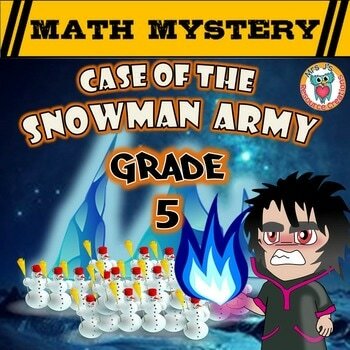 In order to save themselves and to stop the melting issue in the city, they will be required to use their math skills to solve the mystery behind his condition and the cure he needs to restore to human! 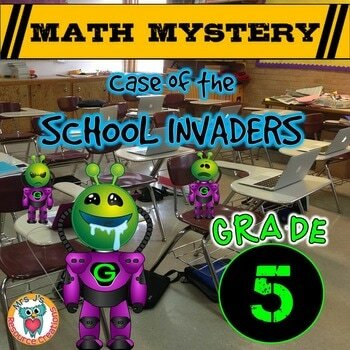 Engage and motivate your students during math time with this fun summer math mystery! This decimals review covers rounding, adding, subtracting, comparing and multiplying skills. This fun activity will engage and motivate your class whilst getting lots of decimal practice in! 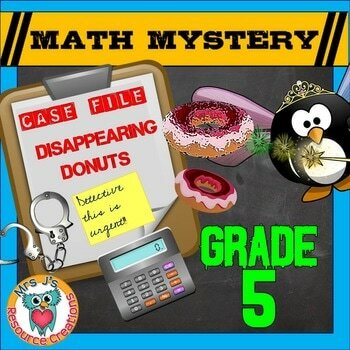 Students will be using their math skills to solve the Case of The Disappearing Donuts. 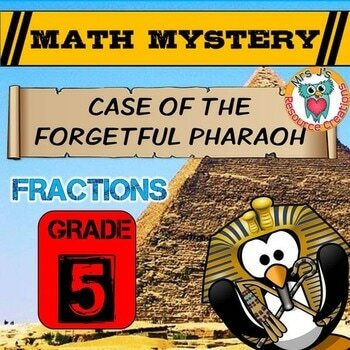 Students must use their fraction math skills to solve the math mystery for the forgetful Pharaoh! 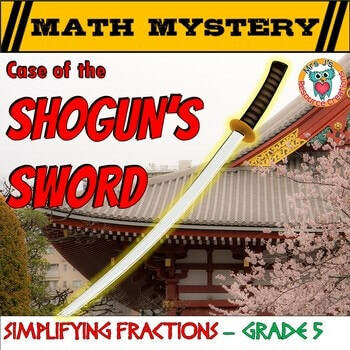 They will be required to apply a variety of fraction skills to discover important clues to find where the Forgetful Pharaoh left his scepter. 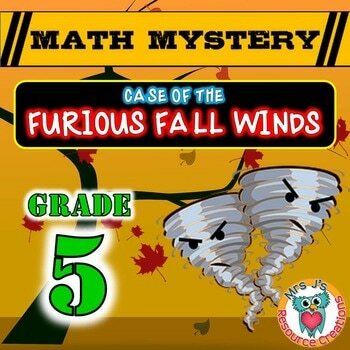 Engage and motivate your students to review volume math skills with this fun math mystery. 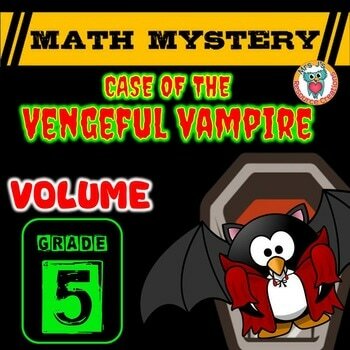 Students must use their volume math skills to discover where the Vengeful Vampire's coffin is hiding! 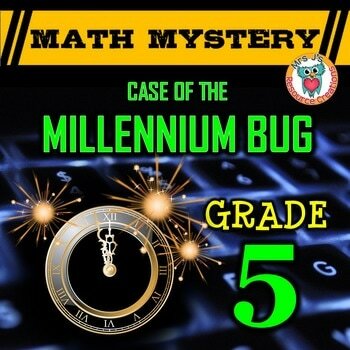 Engage and motivate your students to review their multiplication skills with this fun math mystery activity. This level covers multiplying with whole numbers, decimals and fractions. 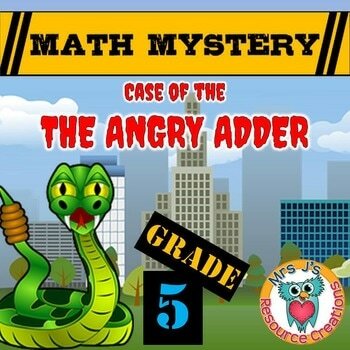 Students must use their addition math skills with whole numbers, decimals and fractions to solve the Case of The Angry Adder! 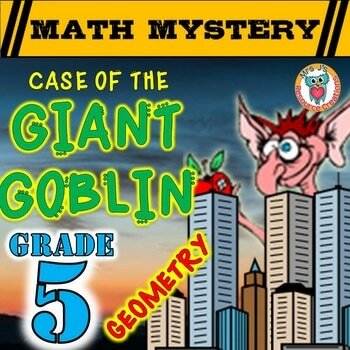 Students use their math skills to eliminate locations & possibilities so they can find out where the Shrinkinator is to make the Giant Goblin the right size again! 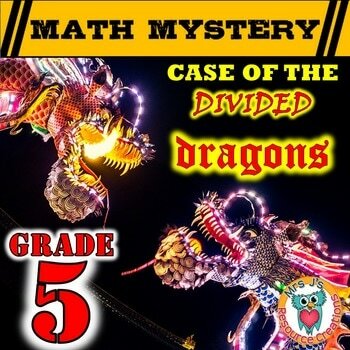 In this Division Math Mystery Activity – Case of The Divided Dragons (GRADE 5) – students will be practicing and reviewing division skills to solve which dragon is responsible for the breaking up of the Dragon Alliance! 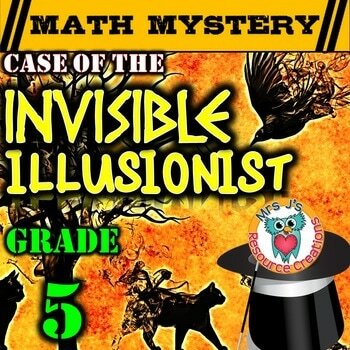 Students will need to answer math problems involving integers that will help them solve which cure will make the Invisible Illusionist visible again! 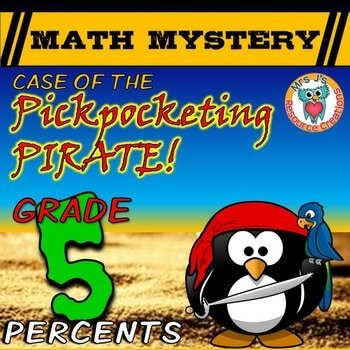 In this Percents Math Mystery: The Case of the Pickpocketing Pirate (GRADE 5), students will be reviewing a variety of percent skills to discover important clues. Engage and motivate your students with these fun NO PREP worksheets. 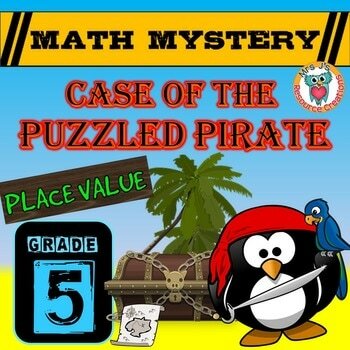 In this Place Value Math Mystery (Grade 5) “Case of The Puzzled Pirate,” students must solve a variety of place value math questions, mainly involving decimals, to reveal clues to help the puzzled pirate find the treasure! 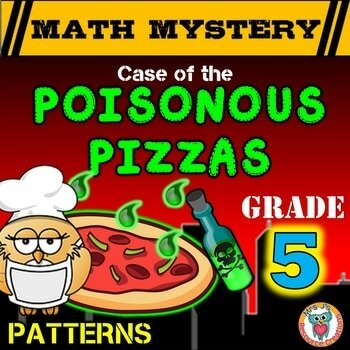 In this Patterns (Number) Math Mystery Activity: Case of The Poisonous Pizzas (GRADE 5), students will be practicing and reviewing number patterns to solve who is poisoning the pizzas in Mathhattan! Algebra one step equations review activity. 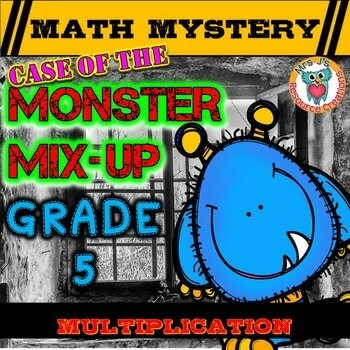 This Math Mystery is a fun activity to review one-step equations with addition, subtraction, multiplication and division. 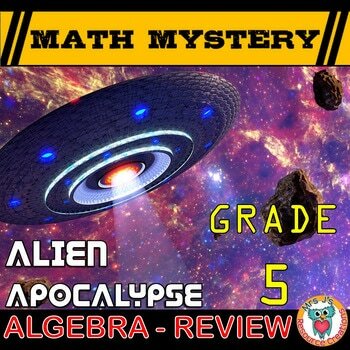 Students must use their algebra skills to discover what the aliens are planning to turn all of humankind into! This rounding math mystery will engage and motivate your students! 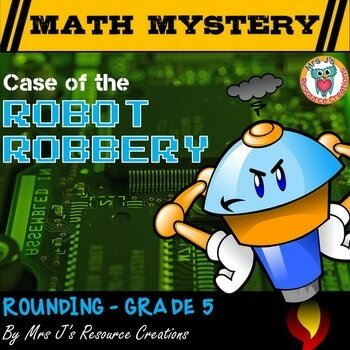 Students will be practicing and reviewing rounding whole numbers and decimals (to the nearest whole, tenth, hundredth), to solve the Case of the Robot Robbery. 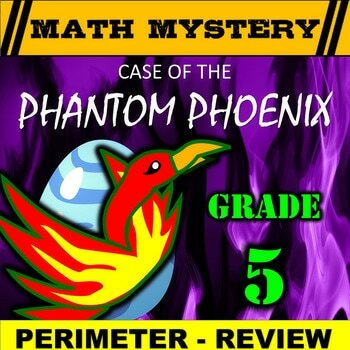 Perimeter Math Mystery Activity – Case of The Phantom Phoenix (GRADE 5) – students will be practicing and reviewing perimeter skills to solve how to open the egg of the Phantom Phoenix! No Prep required, this fun and engaging math activity will motivate your students during math class. 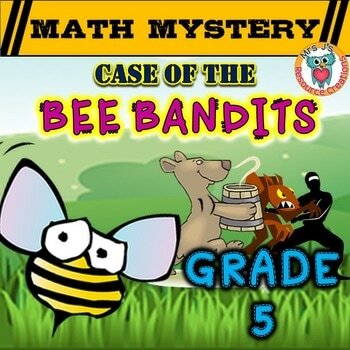 This measurement math mystery will engage and motivate your students! 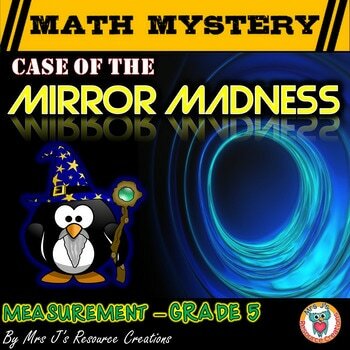 Students will be covering a variety of measurement skills to solve the Case of the Mirror Madness. Both US Customary and Metric Options provided for you to choose from in the download. 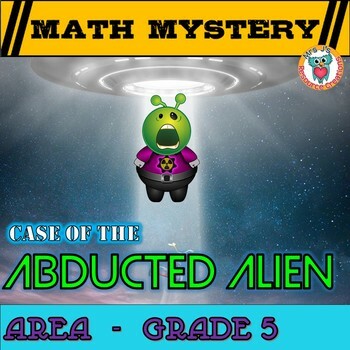 Area Review Math Mystery Activity - Case of The Abducted Alien. Engage and motivate your Grade 5 students while they practice and review AREA skills. Just print and go, your students will have fun trying to figure which Alien Force Abducted the alien Oblang and which planet they are hiding him on! 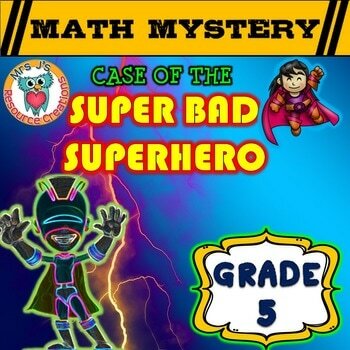 These fun 5th grade math mystery activities are common core aligned and will get your students excited about doing math review! 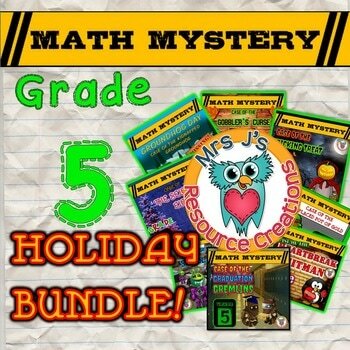 Save time and money with this holiday bundle pack for Grade 5! 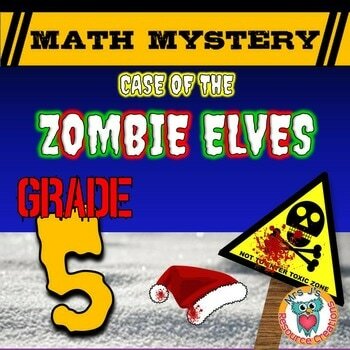 Engage and motivate your students to review a variety of math skills with these ELEVEN fun math mysteries throughout the year. 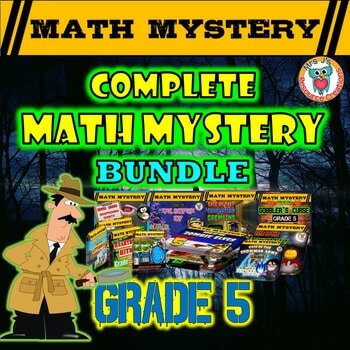 This complete math mystery bundle contains all of my math mysteries for Grade 5 up to date! Make math fun and exciting with these engaging activities that will motivate even some of your most reluctant learners. 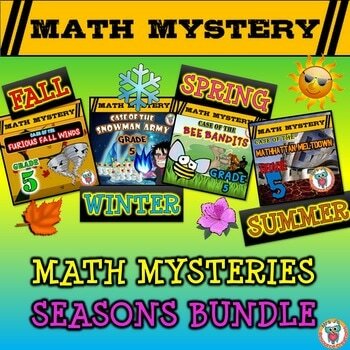 In this Math Mysteries Seasons Bundle Pack, you will receive four math mysteries for Grade 5. Engage and motivate your students to review their math skills with these fun activities that you can do for each season. 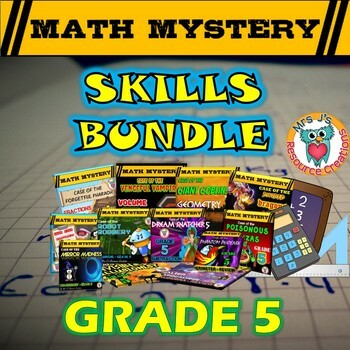 Grab all of the Skill Focused Math Mysteries for 5th grade in this bundle and save 30% off the full price!